US F1 team, Haas, has named Romain Grosjean as one of its drivers for the 2016 Formula 1 season. It will be the first F1 season for the team and also the first change of teams for Romain Grosjean since his return to Formula 1 in 2012. Grosjean will shift from the Lotus team, which will be taken over by Renault after its battle with insolvency. "Formula 1 is incredibly competitive and the only way to succeed is by finding new ways of doing things. This is a new opportunity with a new team that is taking a very different approach to Formula 1. I believe in their approach and they believe in me," says Grosjean. 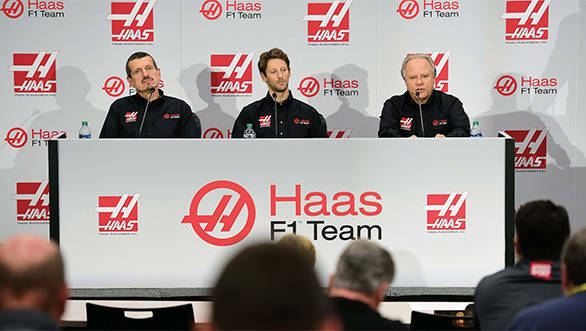 The Haas F1 Team is the first American Formula 1 team in 30 years and is owned by Gene Haas, the co-owner of the Stewart-Haas NASCAR racing team. The team bought the headquarters of Marussia in Banbury, England, after the Marussia team went bankrupt in 2014 and has also signed a deal with Scuderia Ferrari to supply engines and technical-support to the team. There is no confirmation from the Haas F1 team on who the second driver will be, although there is speculation that it could be Esteban Gutiérrez, who drove for Sauber in the 2013 and 2014 F1 seasons. "We wanted an experienced driver capable of developing our car and our race team into one that can score points and better itself each race and each season. We found him in Romain Grosjean," said Gene Haas. Experienced Racer Joins American-Led F1 Team KANNAPOLIS, North Carolina (Sept. 29, 2015)  When Haas F1 Team makes its debut in the FIA Formula 1 World Championship in 2016, it will do so with an experienced racer in Romain Grosjean. The 29-year-old Grosjean has competed in 78 Formula One races and scored 10 podium finishes, with the most recent being a third-place result in August at the Belgian Grand Prix. He is currently in his fifth Formula One season with Lotus F1 Team. Grosjean is highly regarded as a team leader and potential world champion. The Frenchman will get his first drive with Haas F1 Team during the preseason test March 1-4 at Circuit de Catalunya in Barcelona. A second test at Barcelona takes place March 15-18 before the season-opening Australian Grand Prix April 3 in Melbourne. "We wanted an experienced driver capable of developing our car and our race team into one that can score points and better itself each race and each season. We found him in Romain Grosjean," said Gene Haas, founder and chairman, Haas F1 Team. "I've been involved in motorsports for a long time and learned early on the most crucial component is the driver. Romain has strong credentials and he will be an important asset to Haas F1 Team." "What Gene Haas and everyone at Haas F1 Team is building is impressive, and I'm very proud to be a part of it," Grosjean said. "Formula One is incredibly competitive and the only way to succeed is by finding new ways of doing things. This is a new opportunity with a new team that is taking a very different approach to Formula One. I believe in their approach and they believe in me. While I am committed to giving my absolute best to my current team in these last five races, I am very excited for what the future holds at Haas F1 Team." "In addition to being an experienced Formula One driver, Romain is very technically minded," said Guenther Steiner, team principal, Haas F1 Team. "He gives strong, specific feedback as to how the car performs. As we develop our car in testing and throughout the season, his insight will be crucial." Grosjean has won races and championships in every division he has competed as he advanced to Formula One. He transitioned quickly from karting to cars in 2003, winning all 10 races in the Swiss Formula Renault 1.6 championship, handily earning the series title. Another 10-win season in the French Formula Renault 2.0 championship in 2005 secured a second title. Grosjean moved up to Formula Three in 2006 and competed in the full Euro Series schedule. He also drove in two British Formula Three races that year, taking the pole, the win and setting the fastest lap in both races. A second season in the Formula Three Euro Series in 2007 paid big dividends as Grosjean took four poles and six wins en route to the championship. He graduated to GP2 in 2008 and maintained his title-winning form by earning four wins in 10 races to take the inaugural GP2 Asia Series crown. By 2008, Grosjean was in Formula One as a test driver for Renault. In August 2009, Renault named Grosjean to its race seat alongside two-time Formula One champion Fernando Alonso. The experience garnered during that seven-race stretch of Formula One races was invaluable, and Grosjean augmented that experience in 2010 by tackling a variety of series. He won the Auto GP championship with four wins, seven podiums and three poles. He also earned two FIA GT1 World Championship wins and two GP2 podiums. Displaying his versatility, he competed in two 24-hour endurance races at Le Mans and Spa-Francorchamps, respectively. In 2011, Grosjean returned to GP2, first winning the Asia Series championship in its final year of existence, and then the GP2 title with a season-best five victories. He also returned to Renault as its Formula One test driver. With the Renault team under new management and rebranded as Lotus F1 Team for 2012, Grosjean was named to the race seat alongside 2007 Formula One champion Kimi Raikkonen. Grosjean's first podium came in the fourth race of the season at Bahrain. Three races later in Montreal, he finished second. A third podium was earned in the 11th race of the year in Hungary. The 2013 season was an impressive one for Grosjean as he scored six podiums, highlighted by a second-place finish at the U.S. Grand Prix in Austin, Texas. The 2014 season saw the introduction of a new engine formula, with turbochargers returning to the sport for the first time since 1988. The development curve was steep for many teams. Grosjean recorded two eighth-place finishes in Spain and Monaco, but regularly outpaced his teammate throughout the year. Fourteen races into 2015, Grosjean has shown the form he displayed in 2013, as evidenced by his podium at this year's Belgian Grand Prix. In 2016, Grosjean brings his experience and ambition to Haas F1 Team  the first American-led Formula One team in 30 years.